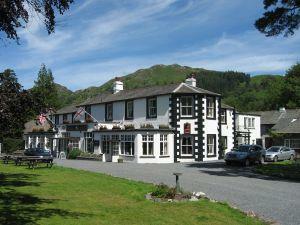 Scafell Hotel Country House HotelThe Scafell Hotel, formerly a coaching inn is set in tranquil grounds with gardens bordered by an adjoining beck, situated in the very heart of the Borrowdale Valley just off the road leading over to Buttermere via Honister Pass. The hotel's location surrounded by some of Lakeland's highest fells makes it a walkers paradise, or for those seeking more leisurely strolls, restful walking through the valley with peaceful woods, meadows and riverbanks. Derwentwater Lake nearby, has walks around its lakeshore with the added attraction of a boat service appreciated by walkers as an ideal form of transport to, from those on the Coast to Coast Walk, Cumbrian Way, Allerdale and Lakeland Ways. The hotel has 23 en-suite bedrooms, all of which have been re-furbished for 2009 in a Warm and Rich Country House Style with a Contemorary Twist. The dining room/restaurant is open to non residents and renowned for its fine food and wines, complemented by service from a courteous, attentive and friendly staff. Fully licensed with cocktail and public, riverside, walker bar serving real ale and a spectacular selection of malt whiskies, both bars are well known for their bar meals. From M6 jct 40 follow A66 to Keswick. take B5289 from Keswick to Rosthwaite, approximately 30 minutes from the motorway. Trains to Penrith and buses to Rosthwaite.